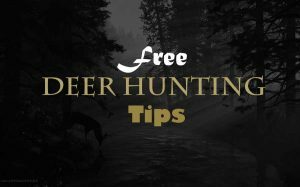 The best free deer hunting tips are the ones that you figure out for yourself and can offer to others especially if your a beginner. After all, few things feel better than finding the way that works for you. Of course, until you reach that point, here are some of our free deer hunting tips to help you get there. Deer are generally crepuscular: they are often active at dawn and dusk and sleep during the middle of the day and night. This does not, however, mean that you will not see them feeding during the middle of the day. Go scouting. Do this during early to late summer. When you scout, be as careful as if you are actually hunting. Stay quite and do not leave much scent. Find the food source that the deer will be eating during the hunting season. Look for trees that will have the most acorns. Look for areas with greens like clover or rye covering the ground. Look for deer trail routes. The ones with the freshest tracks are the best. If you are going to set up any sort of hunting stand, be sure to set it up pre-season, before the deer start feeding in that area. Otherwise, you can scare them off. Mark your “hot spots” on a GPS. Also be sure to take lots of notes. Do not expect to simply remember everything. You want to write down everything that you find. You can find where the bucks are if you scout during the pre-season, right after the bucks have rubbed the velvet from their antlers. During this time, the rut (mating season) a buck is going to leave more markings on trees than he will afterward. Look for areas with thick and dense brush. It is in areas like this that deer like to sleep. You can set up on the outskirts of such an area… somewhere where you will be able to see better. Remain still! Do not move unless absolutely necessary! Do not fall asleep! This can be tricky when you remain so still, but falling asleep not only will lose you your deer, but it can also be quite dangerous if you are up in a tree stand. Use special products to mask your scent. Deer have an excellent sense of smell. Keep the wind direction in mind. Stay downwind of whatever feeding or sleeping spot, etc. you are “staking out.” Constantly check for changes in the wind. Wear a harness if using a tree stand. Move the site of your tree stand around. You do not want your deer to start associating deer stands with humans! Try to avoid walking a long a deer trail or even walk parallel to one. Take the back route… walk up streams, etc. Be sure to always be ready. Make sure that you have checked your equipment right when you get to the stand, not once a deer is already out! The majority of deer are shot downwind from a food source. These are only a few free deer hunting tips. There are actually many deer hunting tips available on many different websites from many different, experienced hunters. Before hunting in a certain spot, is a good idea to ask locals hunters for their own, personal tips. Different areas can vary, and everyone has his or her own tricks of the trade.